Chief minister Pema Khandu on Sunday visited the Yidga Choisin Gonpa,Tawang, the venue being revamped to host the proposed visit of His Holiness the 14th Dalai Lama during March 2017. While taking stock of the preparation for the visit, he expressed satisfaction over the pace of work and also suggested some vital changes. 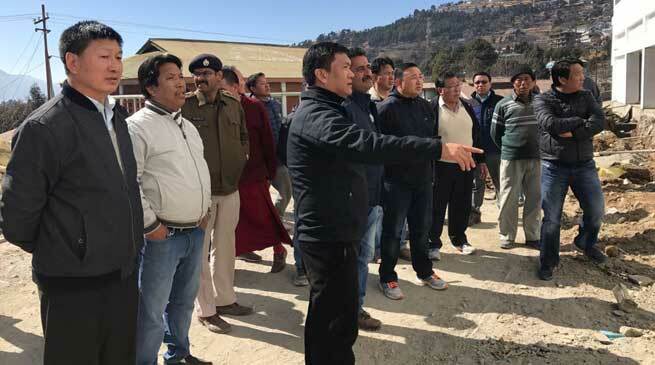 Khandu also inspected the progress of work at High Altitude Stadium, Tawang . The Rostrum within the Stadium which is getting its final touch shall be inaugurated by His Holiness the Dalai Lama. PWD Tawang is the executing agency for the work. Further, while informing that a Government College is to be started in the District from the coming Academic Calendar, he said that as the permanent structure shall take time to come up, a temporary location/building needs to be explored to house the Institution. He suggested that Govt. HQ Primary School, Tawang and Ground Floor of the Rostrum within the Stadium may be considered for the same. College has been one of the long term demand of the area as the district is yet to have one of its own and youths of the district has to move out to pursue further studies after passing Higher Secondary level. Bomdila College in West Kameng has been the nearest option for those seeking admission in college. Chief minister was accompanied by HMLA Tawang Tsering Tashi, Chairperson Zilla Parishad Jambey Tsering, DC,SP, Padmashree Lama Thupten Phuntsok, SE (PWD) and DDSE, Tawang amongst others.